It’s the week before Easter and I wanted to make something super special for my daughter to take to school to share with her teachers. I’ve never made carrot cake before… honestly, I’ve never really eaten it either because usually when it’s served somewhere, it has nuts… and I’m allergic. Boo. So this carrot cupcakes have no nuts but LOTS of flavor! I searched and searched and searched the internet for a recipe. There are LOTS of carrot cake and cupcake recipes. A LOT. Some had pineapple, some apple sauce, some coconut or raisins. WHICH DO I CHOOSE?!?! Finally, I settled on this recipe from the Food Network – 24 Karrot Gold Cupcakes. There wasn’t one negative review on the recipe, so that had to be a plus. But – of course I couldn’t help but doctor it up a little bit and put my own spin on things. They turned out SO YUM! Why haven’t I made carrot cake before!?!? I also decided after seeing this tutorial by No Biggie for DIY carrot cupcake toppers that I wanted to make my own version of them to top these cupcakes! I mean how much more perfect are carrot cupcakes topped with carrots? At the bottom of this post you’ll find my adaptation of this No Biggie’s tutorial! In a large bowl, sift together the flour, baking powder, baking soda, salt, cinnamon, nutmeg and ginger. In another large bowl, beat the eggs. Add the oil and mix together. Add the sugars and whisk until smooth and there are no more sugar clumps. Add the vanilla, pineapple, carrots and milk and whisk until combined. Add the wet ingredients to the dry ingredients. Fold until completely combined. Do not overmix. Fill cupcake liners 3/4 full and bake 17-20 minutes or until a toothpick comes out clean. In the bowl of your stand mixer, cream together the butter and cream cheese. Add the vanilla bean seeds, vanilla extract, salt and heavy cream and beat until incorporated - about 2 minutes. Mix in the powdered sugar, one cup at a time, until smooth. Beat on high for 2 minutes. Using a large round tip fitted on a disposable piping bag, squeeze a large round dollop of frosting on to the top of each cupcake. Top cupcakes with sugar flowers, PEEPS bunnies and DIY carrots. 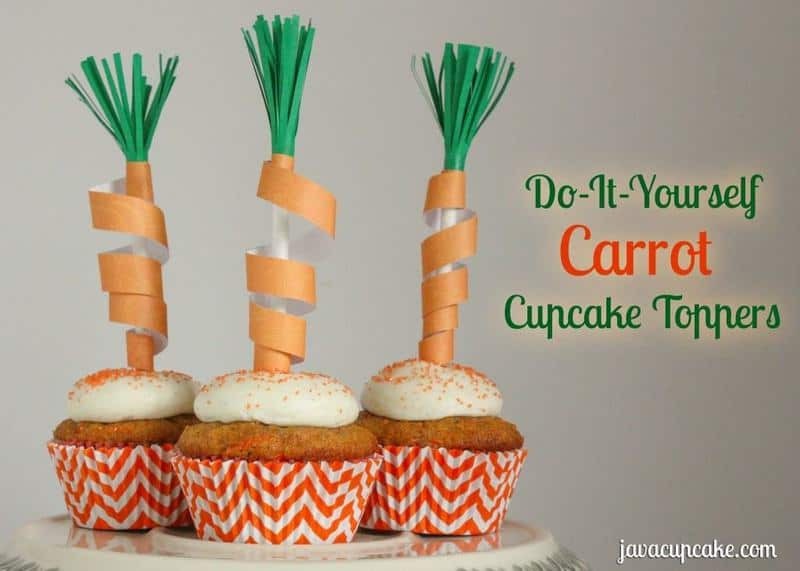 For all the ins and outs to make these carrot cupcake toppers, visit No Biggie’s blog for the full tutorial! I didn’t have all the supplies and tools she had to make them exactly the same, so I used what was in my house and I still think they turned out great! Spread the glue stick on the uncut length of the green card stock. Wrap that tightly around the end of the lollipop stick and hold for 30 seconds for the glue to adhere. Fray out the fringe. Wrap the orange paper around the center of the lollipop stick and hold for 30 seconds. Let go of the paper, it will be curled up like ribbon. Glue the outer edge of the curled paper to the top of the stick at the base of the wrapped green fringe. Glue the bottom inner edge about half way down the stick. You may want to move the paper up/down or adjust it to how it looks best before gluing the bottom to the stick. Hold the paper in place to let the glue adhere. Wondering where I got some of these cupcake supplies? 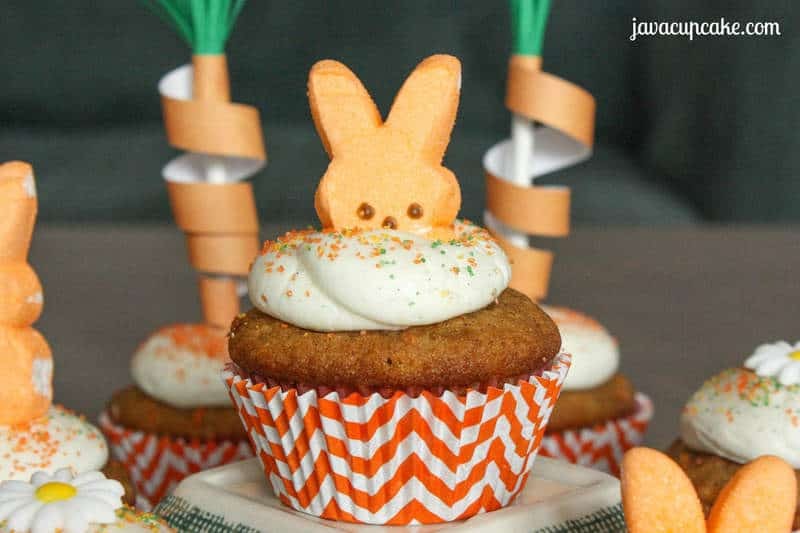 Orange marshmallow bunnies – PEEPS & Co.
Over 20 Recipes Perfect for Spring! Too cute, Betsy! 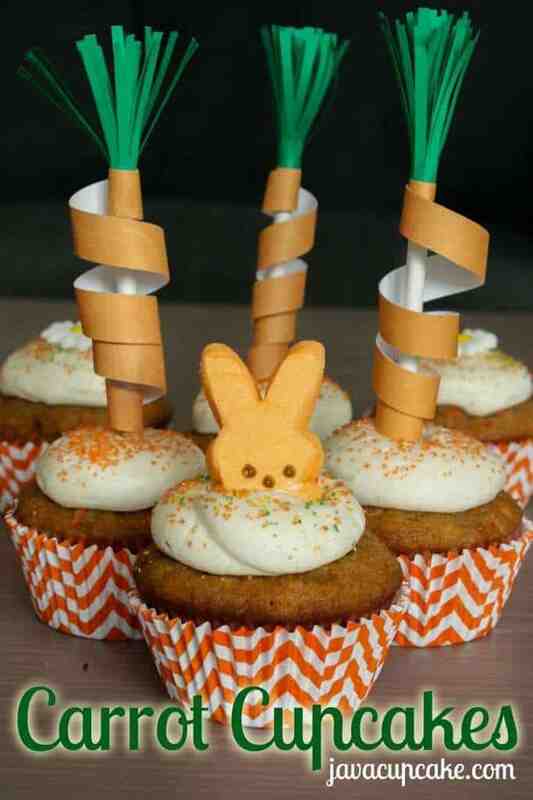 The carrot cake is great for this rabbit and carrot Easter theme. I love it! Enjoy your site and post, but have a problem with the red print in the recipes. Being so small it washes out. Ever think of changing? Will be trying this.